We (Bettie & Belle) met in Toronto to attend The Walrus Talks Philanthropy. Eight speakers had seven minutes each to pitch their point of view on the topic. Given that we are fabulous & frugal, we were there to see Robin Taub, powerhouse financial literacy consultant. We loved every minute of the entire event! Watch it for yourself here. Robin answered the question: How can you afford to give, when there is nothing left to give at the end of the month? According to Robin, it’s all about changing what we earn, spend, and have. -Earn: Ask for that raise, pick up extra shifts and—my favorite—reassess our investments to increase their return. -Spend: This one is not easy, it calls for distinguishing between needs & wants. I ask myself the cookie monster question. Older and wiser, Robin urged us to make value judgments; there will not be any second guessing, if we buy according to our values. – Have: I think critically when adding to my closet, but Robin took it a step further. Robin wants me to clean out my closet and have a garage sale. Robin must have heard me gasp, but she reassured the audience, if Oprah can do it, we can too. My biggest “Amen” moment was when Robin concluded that financial literacy can be intimidating, but conquered by making informed everyday decisions. It’s these decisions that add up. Robin urged us to make decisions that will add up to have extra money at the end of the month to give. Moi aussi, j’adore Robin. Mais, j’adore Mustafa Ahmed plus. Mustafa said everything I have ever wanted to say about love and the value of time…in a poem. “Love is the only thing that really can hold us together.” [Thunderous applause.] Think about it! It’s all I have been able to think about since Tuesday. Watch and be mesmerized by Mustafa! 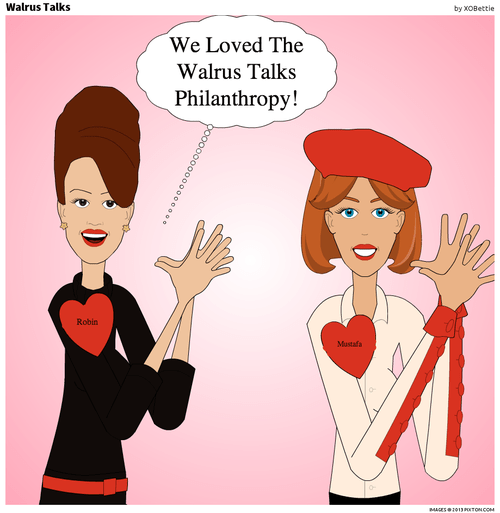 We learned a lot at The Walrus Talks Philanthropy. Spread the word and keep the conversation going! What a simple and practical approach! Many thanks for sharing this information.